Torque News takes a closer look at what many believe to be Honda’s best Civic offering yet. We spend a week in the seat of Honda’s best selling 2016 Civic Sedan Touring. With 90,000 + Civic’s sold in the first quarter of 2016, as is often said: "The public has spoken." 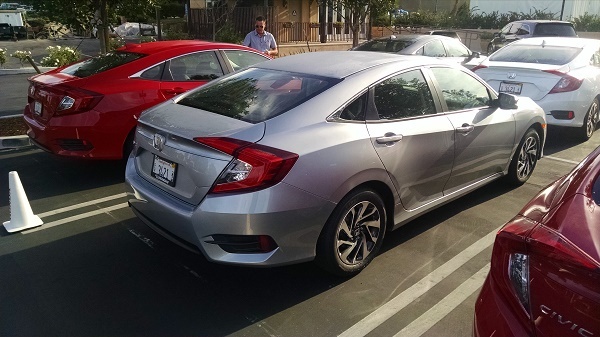 Granted, I’m one of the journalist that piled accolades on 2016 Civic Sedan and then Civic Coupe after experience the 10th generation Civic for the first time in Malibu and then San Diego, California. Read my first impressions here. Prior to those events, I’d spent a thousand miles or so behind the wheel of the 9th generation Civic, and while light years ahead of the widely panned 2012 Civic sales dud, as to interior quality, increased sound deadening, and improved ride dynamics, Civic, although the top selling compact sedan(retail)in the segment, needed just a bit more -- it got it! 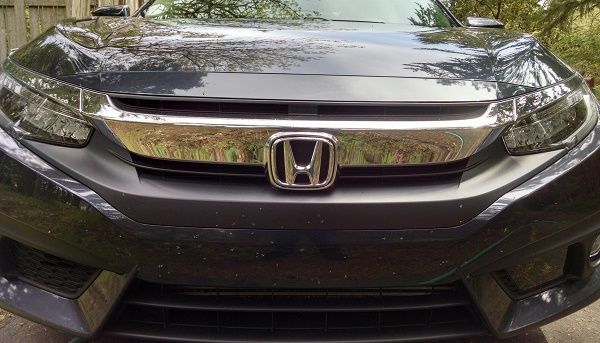 These days outside of the proudly placed flying “H” centered on the 3-dimensional grill, one might be hard pressed to identify the 10th generation “World-Civic” as a Civic. Honda engineering and design informed Torque News that they’d intentionally bench-marked Audi, BMW and other premium entries in the European compact sedan segment for inspiration, while penciling Civic’s new body line. The European design influence is evident throughout Honda’s latest Civic manifestation. I enjoyed Civic Coupe in San Diego. While no longer a sub compact, nor an entry-level compact sedan for that matter, 2016 Civic comes to market approaching the midsize car segment -- with a wider, lower profile as well as driver and passenger seating positions. Civic may be the highest priced in the entry-level compact sedan segment, but then again, it isn’t claiming to be an entry level offering. We found 2016 Civic Touring’s lower seating position to be a bit of a challenge while entering and exiting Civic; although worth the effort when measured against the new “ over-the-road” visual and sense of control afforded the driver. The forward visual is optimal, and the vista out the rear window quite acceptable, with massive rear-view mirrors, the back up cam and right-side Lanewatch ™ picking up the slack. When Honda tells you that 2016 Civic is the most advanced, stock horsepower and torque non Si offering in the marks 43 years, you may take their word for it. This Civic delivers as promised, with with no sacrifice noted as to interior comfort, engine performance, passive and active safety features, and the highest average MPG found today. *In a non hybrid 4 door compact sup premium sedan. You will find full specifications and pricing here. When it comes to 2016 Honda Civic Sedan Touring, the 1.5 Liter turbocharged VTEC EarthDreams ™ gasoline engine delivered mind blowing fuel efficiency while driving the back roads and city streets of Eugene, Oregon. I have no doubt that our 2016 Civic Touring test mule, with 4300 miles showing on the odometer, meets or beats Honda’s EPA MPG rating of 31 city/ 42 Hwy. The turbocharged 4 cylinder when coupled with Honda’s CVT automatic, comes on from 1800 rpm and pulls like a freight train. In fact, the 0 to 60 time indicates that the current Civic Touring is quicker off the lite than the 9th generation Civic Si..
Fast is fine, but most of you reading this will look to 2016 Civic for everyday commuting duty , grocery shopping, short trips, and the occasional night on the town. Civic has a bit of a split personality in this category, thanks to a high revving turbocharged engine that settles down into a low growl when driven at the speed limit. Honda has opted to retain a center mounted 5 position stick. In the “L” position, Civic rockets off of the light with the best in the segment. In “S” we discovered a long legged beast with seemingly endless torque band. “D” is drive, and that of course is what it does. You will also find ECON mode. We found this feature to work very well in Civic touring for optimal fuel economy, and in-fact left Civic in ECON mode for city driving. For 2016, Civic comes to market with a much improved ride quality. The interior is larger than previous generations, quieter and consisting of a greater touch and visual quality. Granted, Civic is not an Acura, Lexus or even a Honda Accord. But, Honda design and engineering has gone to great lengths to present a quality package here. I discovered no glaring short cuts, “would haves, or should haves” in Civic, none! You, know, I’ll stop just short of calling Civic perfect. For me, the seats are just a bit stiff -- but that’s me. I do like the center console layout, single static touch control panel/ backup cam monitor and personal electronic device connectivity. It all works well. Honda’s done a commendable job in balancing Civic price point ($18,640 to $26,650+) without sacrifice of quality look and feel of soft and hard contour surfaces plush seating and comfortable arm rests. There’s just enough bling and style in Civic to catch one’s attention and hold it. It’s not boring, nor ostentatious, perhaps something in between. This Civic’s grown up nicely. What I like about Civic: Refreshed European styling, EarthDream ™ engines performance, Fuel efficiency, Interior finishes, Wheel and brake designs, Lighting and road handling. I recommend a 2016 Honda Civic test drive to anyone seriously considering the lease or purchase of a realistically priced not-so-entry-level compact sedan or coupe with exceptional standard features, safety, styling, and drive and ride characteristics. Hi, There's a mistake in "In fact, the 0 to 60 mpg numbers indicated".... It should be 0 to 60 mph. Have a nice day. Thanks Daniel for the heads up! Much appreciated. Good day Rodger. That all depends on what you want from the car. Accord is larger,(midsize) offers a V6 engine, slightly smoother ride and measurably quieter interior. However, all of that comes with a price premium. I'd drive both if I was considering a new car purchase from the Honda lineup. * Note: I do prefer Civic's new 1.5 Liter turbocharged 4 cylinder torque-happy mill to Accord's larger normally aspirated engine. However, they both work very well. I have several Accord reviews on this site. You'll find them in our search bar under Honda Accord. Thanks for dropping in. Accord Sport looks fast in the park-position, all the way down to its lower ground effects and 19 inch wheels ; but it isn’t. Yes I know, a bit confusing isn’t it? We spend a week in the seat of 2016 Accord Sport.